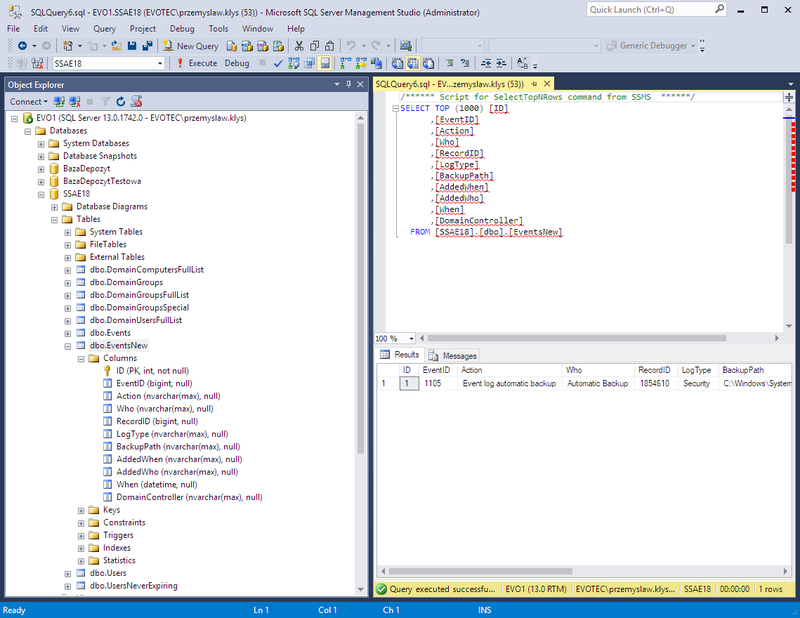 PSWinDocumentation – Version 0.1 with Word / Excel exportPowerShell Core – The type initializer for Gdip threw an exception. It's been a while since PSWinReporting has been updated, or rather since I've written a blog post about it since it's always work in progress. This release is just a wrap up for multiple new features that were added and tested last few weeks, months. Each new feature brings something to the table. Just to add that not everything is enabled everywhere. It's not possible or rather it doesn't make much sense to use Microsoft Teams / Slack notifications in the old method of scanning event logs. Largely because it would required 30+ minutes per scan to finish depending on how large environment you have. Instead those methods rely on using Windows Event Forwarding where all domain controllers report additionally to one central place and store Event Logs in there. Of course only the one you want, request it to. Therefore it's possible to have your Domain Controllers log everything that happen and essentially have 40GB of Logs each month and still have 100MB of essential data that this module is able to parse. Windows Event Forwarding - How do I use it? 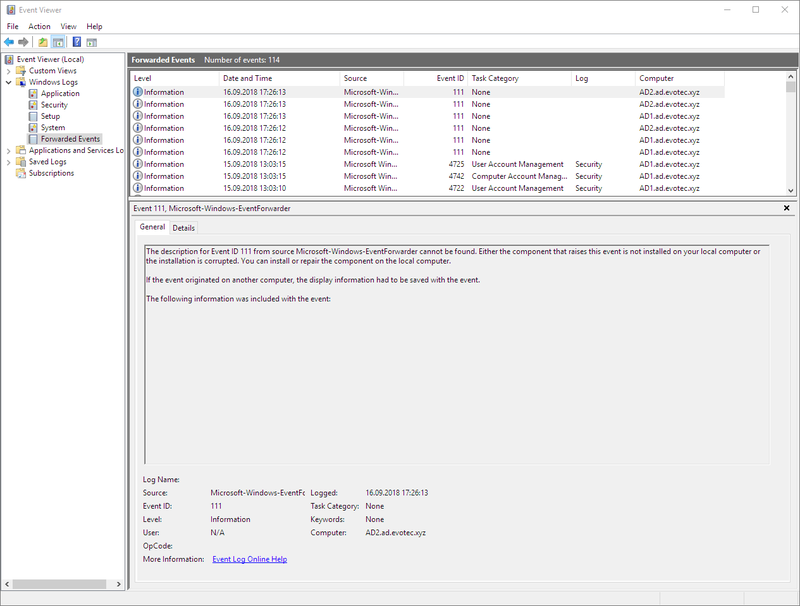 Windows Event Forwarding is a bit of pain to setup and get it run correctly. This module has some functions built-in that are supposed to help you set it up correctly from A to Y. The last Z step you may need to do yourself. And that are permissions. Keep in mind that you can either choose totally separate machine for this task (but as secure as your DC) or even use your DC if you have small enough domain. I'm encouraging you to start using Forwarding for a simple reason.. scanning 2,5,10 domain controllers for events that often store 99% more information is both time consuming and hard to maintain. By enabling Windows Event Forwarding you get few new features and old features work in seconds/minutes instead of minutes/hours. You need to attach that script to Task Scheduler so that when new event is pulled from Domain Controllers it's fed to the script. This can be setup by hand or by using RunMe-CreateTasks.ps1 that is part of this package. Keep in mind that this script sets up things on defaults. It doesn't ask you for credentials, it doesn't set up any permissions. This means that if new Task Schedule is created it works under SYSTEM account. Same goes for Subscriptions. If it's setup it uses Machine Account. You can and should change that to match your domain. 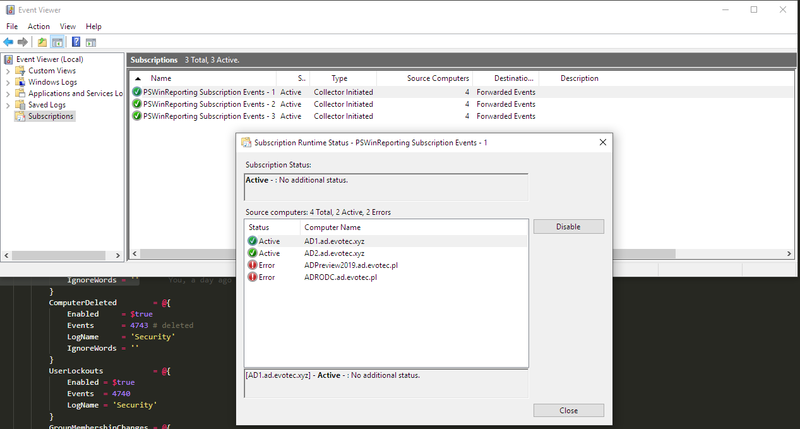 Script above sets up Event Log Subscriptions. When it's run it should create 1 or more Subscriptions that will cover your whole domain and what you've set up in configuration. Depending on what you've chosen in config it can be 1,2 or 3 new subscriptions. When you rerun the script it will create all necessary providers and will use built-in template that comes with PowerShell Module. It's encouraged to use this module directly from PowerShellGallery. Keep in mind that script when rerun will delete it's own providers and recreate them on per need basis. This means you can enable some things now, and simply add things at later date. Next step is to copy script below and putting it in place that will be used for Task Scheduler to start it. Keep in mind this script when started will do nothing by itself. 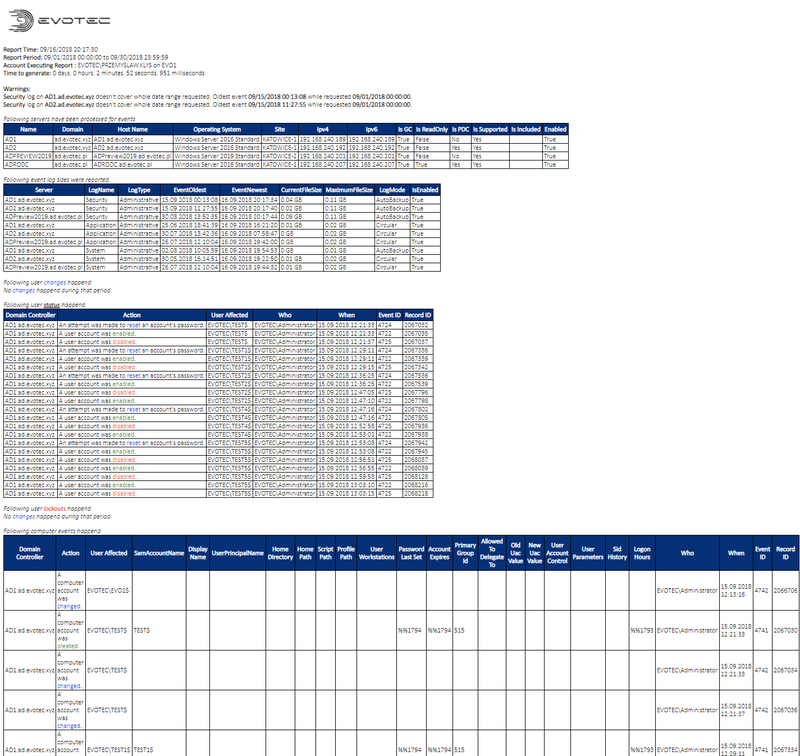 On top of it there are 4 parameters with 2 filled in (EventID and EventRecordID). If you want to use this by hand for verification you can find and Event in your Forwarded Events log and use that as a testing exercise to see if you're getting any data to MS Teams, Slack or SQL. Finally there is one last script that has to be run (or you can set it up manually). Getting the script above to be executed by Task Scheduler when event happens. This script below will create new Task and attach it to ForwardedEvents logs. Output should be something similar to below. 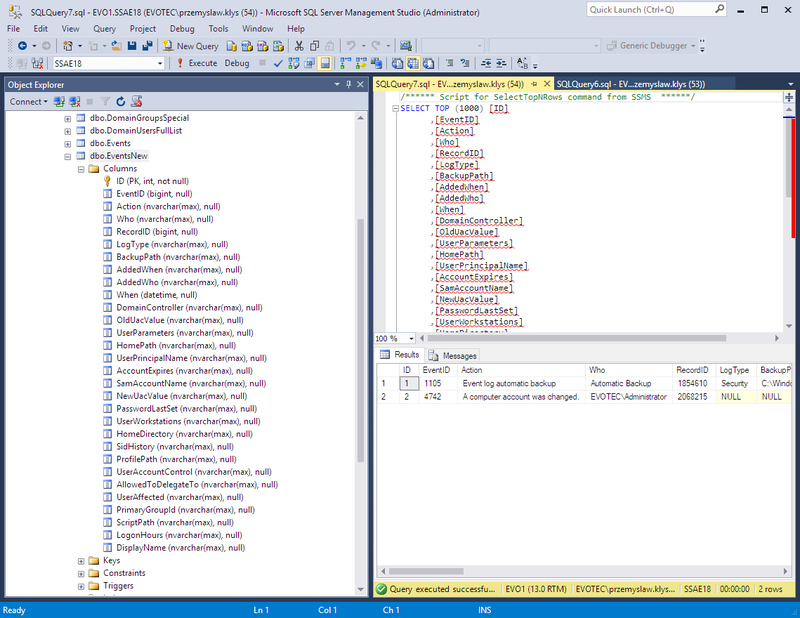 Keep in mind that we again use Template that comes in with this PowerShell Module. You should verify created Task whether it has proper permissions and proper setup. After all those 3 scripts are setup you really need to test this out. Make sure that if you run the task manually that you get notifications you expect (that's why the “default” test data comes useful in the defined parameters). It may take a while before you get this right. It's very important step to get other things running properly. 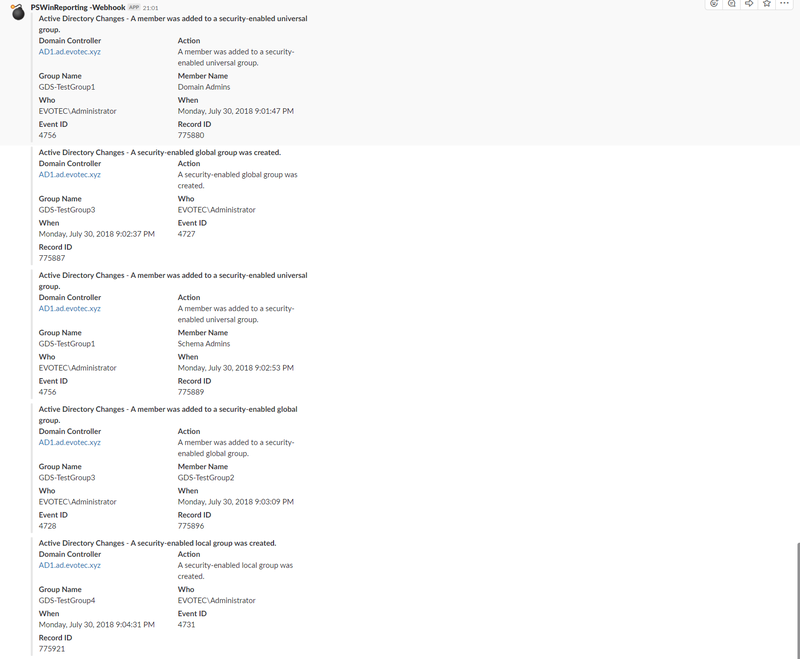 There were some subtle config changes, additions to RunMe-Report.ps1. It should still work the old way but new way of using forwarders is encouraged. Also in this new version Get-ADForest is used to get all Domain Controllers. Not just Get-ADDomain. Therefore you may get some new DC's showing up if you have more then one domain. I've highlighted few, important changes above. But if you've been using very old version it's best to start over and use new config file instead. As you can see below PSWinReporting with help of PSSlack module from RamblingCookieMonster is able to deliver almost instant notifications to your Slack channel as things happen. Of course there will be some delay due to forwarding of events but the message should show up within 1 minute since things happend. 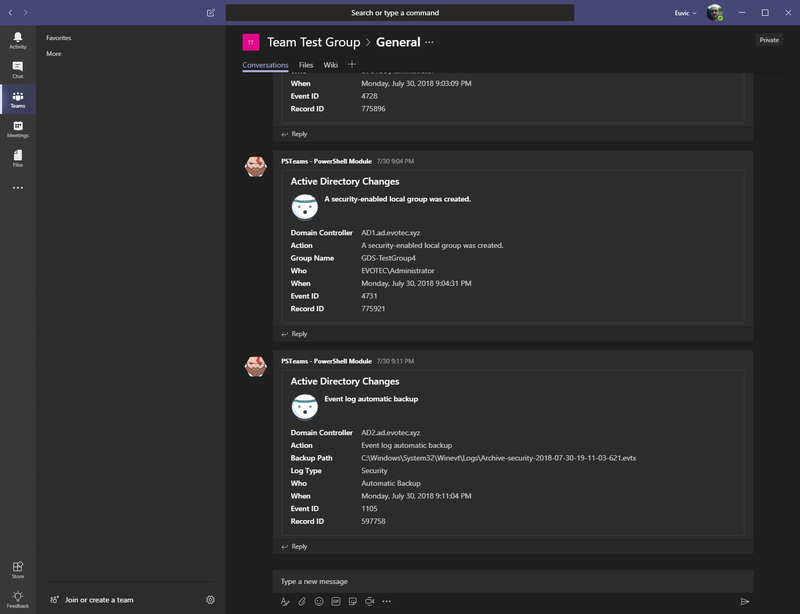 Just like with Slack you ‘re able to send any notification straight to Microsoft Teams. Settings for Microsoft Teams are similar to Slack. If you need to know how to set it up you can follow setup procedure on the Microsoft Teams module page. Other than that.. it's just matter of 2 parameters. Channel name and TeamsID (kind of API key). Keep in mind it's impossible to send notification to Chat. SqlTableCreate – means script will create a table if needed based on SqlTableMapping. However if no SqlTableMapping is available script will create table anyways based on fields and data in columns. It will also try to guess the type of data in columns. SqlTableAlter – when that is set to true and there is no SqlTableMapping any time new row is added it will check for missing columns and alter the table. It only works if there is no SqlTableMapping. Which gives us both table creation and insert of 1 row. In few screens above you can also see one more thing. Copy of Event Log file on Event. It's a feature I've added but not tested much. Probably needs some more love as well. As you can see above the file was skipped because it didn't exists. It didn't exists since I've already copied it multiple times. But if it was there and permissions would work… it would move it to defined place. To finalize this blog… please keep ind mind I've tested this on limited number of systems, resources and it may not be supporting everything you need. Feel free to report bugs / features requests and if time allows me to fix them I will. Also please notice there has been few additions/removals to this module. I've extracted some functions that almost all my projects share to separate module PSSharedGoods. It's heavy work in progress as in I'm slowly removing things from my modules and putting in there, things that are common to most of my projects or are in other ways useful to me. For installation instructions you should refresh the main PSWinReporting page! Keep in mind that if you want to use all those features you have to install few new modules. But if you don't use Teams, Slack or SQL you don't need those additional modules.